Get all the information you could want about your wine, without ever having to touch a piece of lab equipment! 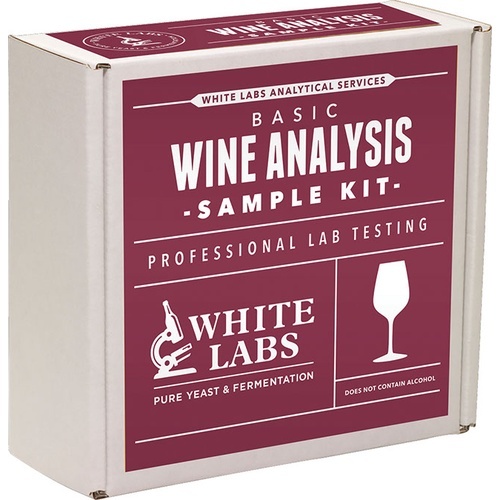 With the new White Labs Test Kits, the process of monitoring your wine has never been easier. Purchase one of the Test Kits, and fill the sterile sample jar inside with your wine. Attach the included shipping label, and log into White Labs online database for your results! The price of the Basic kit will get you results on the Titratable Acidity, pH and Free SO2 levels of your wine. Is this for testing just one wine? I have two that I'm considering and wondering if this will do more than one at a time. BEST ANSWER: Hi Kevin - This is a single test, for one wine.